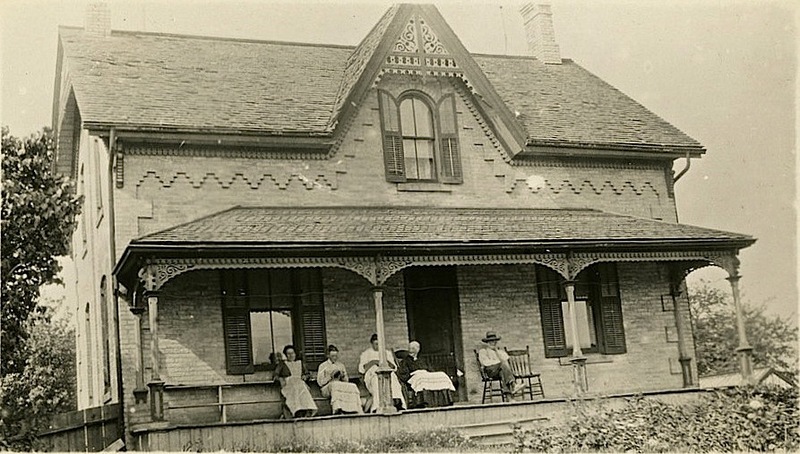 John Cottel‘s Home, Usborne Township, Ontario, ca. 1910, via Huron County Museum & Historic Gaol Commons on flickr. John Cottel, presumably to the right of the door, was born in England in 1836. His wife was Margaret Turnbull, and they had four daughters, three of whom may be in the photo. There is a much wider view of the house and farm here. What a lovely looking house. Wonder if it has as nice detailing inside. Now I have to look up that township as the name is unfamiliar to me. The brick patterns is wonderful. Unfortunately, there weren’t any other photos of the house — except for the outside of the barn.